While Illinois sits along one of the world’s largest freshwater resources, an ocean is closer than you might think. Look down. About 540 million years ago, the state was situated at the equator and was the site of an ancient sea. As land shifted over time, this saltwater became trapped in aquifers that still exist underground today. Illinois-Indiana Sea Grant-funded researchers, thinking outside the box, wondered if this buried saltwater might play a role in producing seafood in the region. Their study revealed that Illinois may in fact, be an environmentally-sustainable and economically-viable location for production of marine fish. They focused on striped bass, a popular and adaptable fish that can be grown in a range of salinities. Currently, the U.S. imports 86 percent of its seafood leading to a $10 billion trade deficit. “It is not surprising that interest in commercial aquaculture production in the marine environment has increased,” said Srirupa Ganguly, an engineer from the Illinois Sustainable Technology Center (ISTC). She was joined in this project by Nandakishore Rajagopalan, also at ISTC, and Kwamena Quagrainie, IISG’s aquaculture marketing specialist, located at Purdue University. The team assessed the competitive advantages of raising this fish in the Midwest using local saline water resources. These sources include saline aquifers, with much of this water brought to the surface regularly in oil and gas drilling, but also water generated from coal processing and other industries. Depending on the source of the saline water, it may come with additional contaminants and need treatment for use in aquaculture. 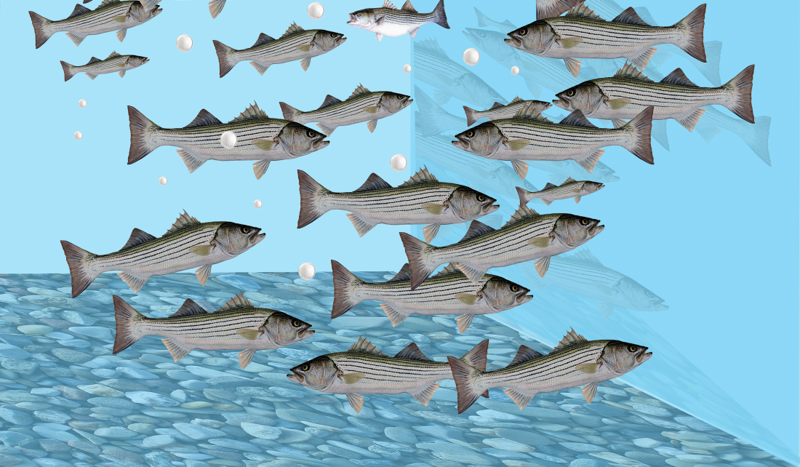 But, does this water provide a suitable environment for raising striped bass? The researchers measured growth, weight gain, and other characteristics of striped bass grown in pre-treated saline aquifer water. “Our preliminary study revealed that fish farmers could substitute potable surface water for saline groundwater for the culture of saltwater species like striped bass,” said Ganguly. Finally, to assess the viability question from all sides, the researchers looked at what motivates consumers as they shop for seafood and their willingness to pay more for locally-raised fish. You can read Quagrainie’s article on consumers’ willingness to pay for saline fish species raised in the Midwest in World Aquaculture Society.